Black men writing about their Jewish mothers seems to be a trend as of late (think James McBride's THE COLOR OF WATER). Nevertheless, this book reads fresh to me, perhaps because of the to-the-day decade between ACE OF SPADES and the parenthesized McBride account. My memory of THE COLOR OF WATER was beginning to fade, and David Matthews's memoir has stepped up to take its place as the biracial book most present in my mind. The story is set around Matthews's childhood and young adult years in Baltimore, trying to find his identity in a black/white world. His Jewish mother leaves him when he is just a baby, and he is raised by his submissive/activist father. "Black" to Matthews is a disease, a melanin destined for a life of pain and destruction. His young self takes a pessimistic stance against the black race's ability to become equal with their white counterparts in American society, and he therefore tries to separate himself from this second-class life and from the father he sees as weak and ineffectual. But things aren't that easy. The white side accepts him only when his blackness is beaten down so strongly that they don't catch the whiff of its scent. His exotic features raise questions and eyebrows, and he forever has to squelch one side of himself in order for the other side to live peaceably in his truculent world. In an area of town where the privileged whites are becoming the minority --- and where the blacks are taking over in number, force and resentment of their status --- his part of town does not allow for subtleties of color or of a mixed-race identity. Matthews's vocabulary is huge, and even the college-educated will find numerous words that they have never come across before. His breadth of the English language put me to shame to such a degree that I began jotting down the unfamiliar words, giving up after two pages because it distracted too much from the flow of the story. Luckily for me, and thus for the majority of readers, his incredible vocabulary won't render the story incomprehensible. For the most part, these terms are used in such a context that the individual can gather their meaning or at least understand the sentence even if the words were taken out. Matthews's honesty in this memoir is refreshing. He doesn't hide his prejudice; he only explains the logicality of why it existed in the first place. His plethora of self-contradictions rings true to a biracial teenager in the midst of finding himself. In fact, all the characters are presented as the well-rounded individuals they undoubtedly are, each on their own path to self-realization and each with their own views of the world. 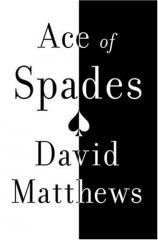 ACE OF SPADES has special significance for me because I, too, am biracial --- my father is black and my mother white. Reading this book is like reading about myself, and I'm sure the same will be true for every other biracial American, of which there is an increasingly large number. It will, however, resound the most strongly with those of us who are of Matthews's generation and older, since being of a mixed racial heritage is now becoming trendy in and of itself. The memoir speaks of an America at a crossroads --- destined to find a new, less polarized identity for itself. This crossroads is exactly what Matthews faces and overcomes.